Housed in the "OLD GREEN HOLDER" The strike is resoundingly sensational for this Type 2 example, on par with any Type 1. Not only does Liberty's head bear the brunt of an absolutely pounding strike, but the lines and stripes of the inner shield are perfectly sculpted to complete linear perfection, and the rivets unhesitatingly brought up fully from their background. Furthermore, due to exquisite care and storage over the decades, Liberty's leg has avoided even the slightest sign of abrading, as would be typical of most roll-stored examples, and there are scarcely an notable contact points at all. This remarkable off-white example fits the bill of a high end coin for overall eye appeal and we can easily see why it has been CAC approved! 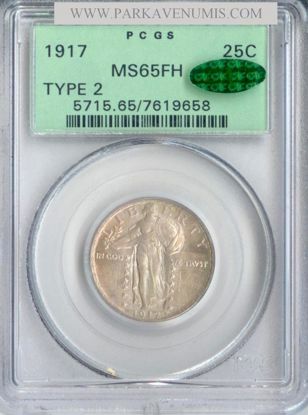 Truly a desirable coin at a great price for any type coin collector or Standing Liberty Quarter enthusiast.